How do you feel about intensity? As in, can you handle it? Because today all eight warriors are on the court, and the entire Final Four will be decided here and now. No mercy for the weak! But, crap, today is BIG. It is a day of blood, sweat, and sugar. It is a day where 50% of the remaining giants will be cut down to size and sent packing. It is the Elite Eight, and all competitors will get their day here and now. Brace yourselves, because these are going to be close matches with the top seeds duking it out. In the Cake Conference, it's #4 German Chocolate Cake looking to teach #1 Birthday Cake a lesson. 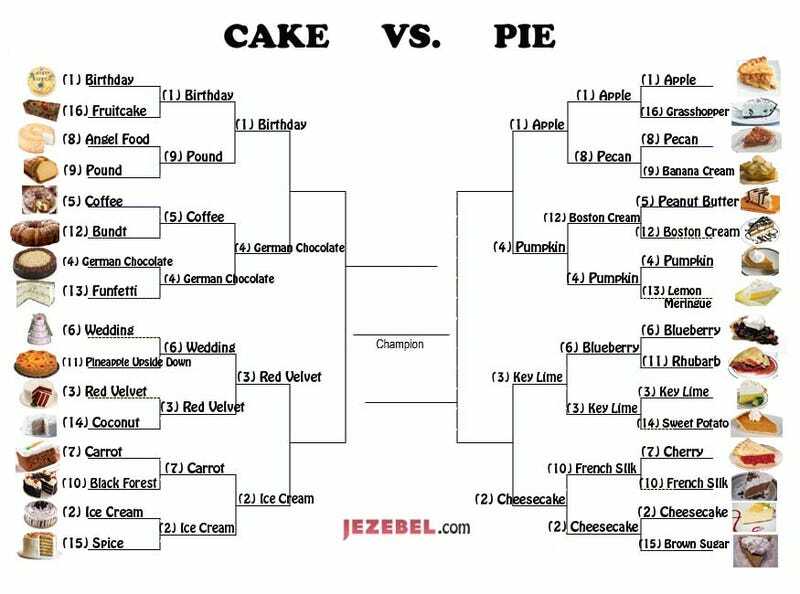 Meanwhile, #2 Ice Cream Cake will take on Red Velvet Cake, the strong #3 seed. Playing in the Pie Conference are all-American giants: #1 Apple is facing off with #4 Pumpkin, and #2 Cheesecake makes a play for glory against #3 Key Lime. And now, it's time. Take a deep breath, focus, and vote. Let these desserts earn their victories. Voting is below; be sure to scroll down and vote in ALL FOUR polls. Voting ends 4/2, at 1:55pm EDT. Also, here's a little something extra: On Letterman last night, Ricky Gervais placed blame for the obesity epidemic.